Our lecture for June 2002 was by Ian Gray who gave us talk called "Telescopic Astrophotography". He showed us unenhanced slides that he has taken at his home/observatory using his 10" Schmidt-Cassegrain telescope. His talk comprised of mainly slides of the Sun, Moon, planets, star clusters, nebulae and comets that he has taken and explaining how he achieved these excellent results. The example of Ian's work on the right is the attractive emission nebula M17 in northern Sagittarius 20m 10" f6.3 telescope on EI 800 film. The main enemy of telescopic astrophotography is vibration through the telescope setup especially when taking photographs of the Sun or Moon, as the exposure is so fast. (Please beware of the dangers of looking at the Sun through any optical instrument). Using a solar filter reduces the brightness of the Sun down to the same brightness as the full Moon. To take an exposure of the full moon, set your camera to the same settings as the exposure of a bright day. It is also worth trying bracketing which means one exposure correct, one exposure one stop under and finally one exposure one stop over. A general rule for the Sun or Moon is to use a slower film like KodaChrome 64 as the slower films give a more accurate rendition of it. Film speed between 64ASA and 100ASA will work well with this kind of subject. Make allowances for the earth's atmospheric effect when taking photographs of the Sun and Moon and increase your exposure time if the object is at 10° to 20° from the horizon. A simple way to take photographs through a telescope is to point your camera into your eyepiece with the camera lens aperture wide open. Set the camera focus on infinity but don't let the lens touch the eyepiece because of vibration. Mounting the camera on a separate tripod is one way of doing this. This is called the 'a-focal method' and can be used for up to a one second exposure. The a-focal method is particularly effective with small telescopes because it requires a minimum of equipment, no camera adapter is needed and you can use any camera with manually adjustable shutter speeds. To take photographs of the planets and deep sky objects longer exposures are required, so a method called 'eyepiece projection' is used. This is to mount the camera on the back of the telescope with a special adapter. For long exposures, guiding equipment is also required such as a guide scope with cross hairs which you manually guide, or an off-axis guider. There is also an electronic autoguider but this makes this type of photography very expensive. A medium fast film such as Elite Chrome 400ASA is also recommended but the colder the night the more the film sensitivity increases reducing exposure time. 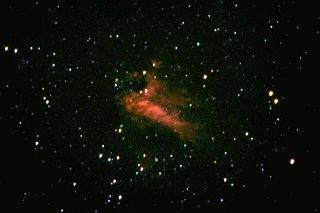 The only way to become good at telescopic astrophotography is to practise and learn by the mistakes made.